Little Jake was popular with the lumberjacks and working class people of Saginaw. While other stores catered to the wealthy, he sold at a discount and lower profit margins making his profits in selling large volume. I think his business model was the forerunner to the outlet and big box discount stores of today. Little Jake’s success with the clothing store enabled him to purchase a trolly line which he proudly had “Little Jake” painted on the sides. Little Jake opened up a bank in the rear of his store, allowing him to cash the checks or bank notes of the lumberjacks. Many lumberjacks would head straight to Little Jake’s in the spring when the season was done. They trusted Seligman and would deposit their hard earned money in his bank. 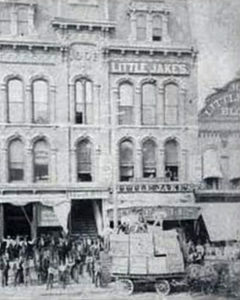 The bank grew large enough that he moved it out of the store to a separate building and was known as Little Jake’s Bank. Little Jake’s success with the clothing store and bank enabled him to purchase a trolly line which he proudly had “Little Jake” painted on the sides. As you can see he like putting his Little Jake name on everything he owned creating a ” Personal Brand” before anyone knew that was even a thing. 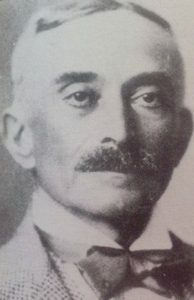 Jacob Seligman purchased the building on the corner of Genesse and Lapeer from Col. Michael Jeffers in 1890. 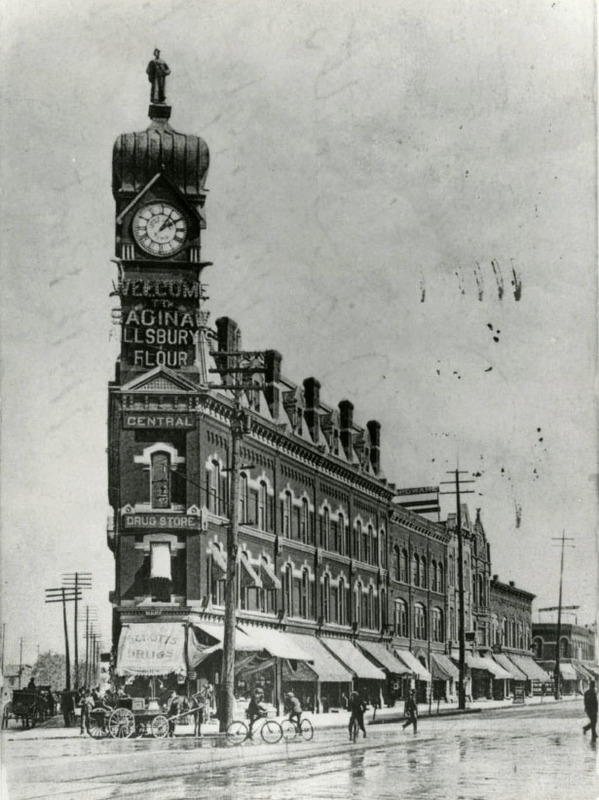 After moving his clothing store to the new location he then erected a clock tower on the triangular shape building. At the time only the wealthy was able to afford a watch and Little Jake installed the clock with his name on it so the working class people of Saginaw would know what time it was. The clock became known as Little Jake’s Time. He also had a statue installed on the top of the tower. He said it was a statue of himself but when it blew down in a storm in the 1940s it was found out it was a statue of a confederate officer from the Civil War. Shortly after the statue fell down the clock tower was removed since it no longer kept time consistently and in 1963 the building was torn down. Little Jakes Businesses continued to grow. He began obtaining real estate in Detroit and was an investor in the Majestic Building on Woodward in Detroit. At the end of the 1800s, the economy took a turn for the worse and many businesses and investors were struggling including Little Jake. He moved to Colorado and invested in mining and in 1911 he was found dead in his home by a self-inflicted gunshot to the head. His wishes were to be buried in Saginaw and his body was transported to the city he loved and it was laid to rest in Forest Lawn Cemetery. Jacob “Little Jake” Seligman was not as influential as Arthur Hill, Aaron Bliss or C.K. Eddy and did not have a school named after him, or held public office. I think he was not well regarded in Saginaw’s high society because of his working class relationships and his carnival-like advertising, but he was loved by the people he sold his products to. It was his endless self-promotion and hard work that made him such and endearing person. I think he would have fit right in with today’s reality TV and social media. P.S. If you are wondering Jakes Old City Grill in Old Town is named after him.